Honda Shadow Forums : Shadow Motorcycle Forum > Motorcycle Discussion > Technical Discussion > Jetology link to Microsoft Word file!!! Jetology link to Microsoft Word file!!! props to docc30 for sending me this file. I really needed it for the near future. Anyways, here's the link. It links to a Microsoft Word file of a Jetology archive! Actually, thank cbjr0256 who did the write up. I just happened to have a copy in word format on my computer. there goes your chance for making it better the 2nd time around Good thing eh? The following is a compilation of information I have gathered on various forums and Internet sites. Some of it is my own and some of comes from other sources. I don't pretend to know all there is about carburetion and jetting of a motorcycle. This is purely from my experience and research. The following information and directions are specifically for rejetting a 1995 Honda Shadow ACE VT1100C2 with the Vance and Hines Straightshots system http://www.vanceandhines.com/ and a K&N Filter. The jet kit used is from Dynojet/K&N http://www.dynojet.com/. 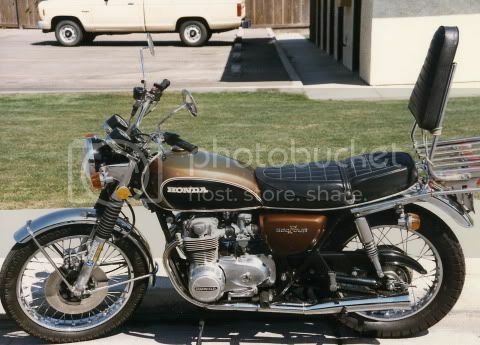 First of all, I will try to explain some of the basic carburetor theory you will need to know when rejetting your motorcycle. Most of the information contained herein can be applied to almost any motorcycle using a CV (Constant Venturi) Carburetor. The basic function of you carburetor is to mix or atomize fuel and air at a specific ratio for combustion. A carburetor works on atmospheric pressure (I am GREATLY simplifying). All carburetors work under the basic principle of atmospheric pressure. Atmospheric pressure is the force which exerts pressure on everything around us. It varies slightly due to temperature, elevation and humidity but is generally considered to be 15 pounds per square inch (PSI). This means that atmospheric pressure is pressing on everything at 15 PSI. By varying the atmospheric pressure inside the engine, we can change the pressure inside the carburetor and make fuel and air flow. When the piston reaches bottom dead center the atmospheric pressure in the engine is less than normal atmospheric pressure outside the engine. This low pressure also causes a low pressure inside the carburetor. When the throttle is opened this causes a butterfly to open in the carburetor which in effect creates a "vacuum" that allows the air to rush through the carburetor and be mixed with fuel (this is where the jets come in) and eventually into the combustion chamber - until the pressure is equalized. The moving air going through the carburetor will pick up fuel and mix with the air. 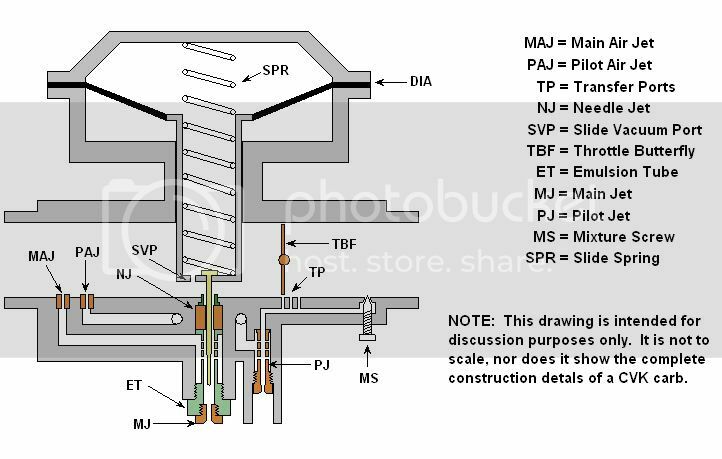 Once again, this is VERY simplified and a lot of other factors come into place but this is basically how your carburetor works. The venturi is a restriction or narrowing inside the carburetor that forces air to speed up to get through. As the air speeds up it causes atmospheric pressure to drop inside the carburetor. The faster the air moves, the lower the pressure inside the carburetor. The pilot jet (or idle jet) main jet and the needle jet are the three circuits you will need to be the most concerned with when rejetting your ACE. The pilot jet is adjustable externally and will need to be adjusted after you have dialed in the main and needle jets. falling or moving from the slide. The clip position on the Dynojet needle can be changed to make an engine run richer or leaner. The stock needles are not adjustable (unless you shim them with washers). If the engine needs to run leaner, the clip would be moved higher to drop the needle further down into the needle jet and cause less fuel to flow past it. A good analogy would be sticking you finger in then end of a garden hose (if you want to get wet). If you stick your index finger in the hole little or no water will come out. As you remove it more and more water flows. If you use you pinky finger for the same purpose, you can adjust the flow much more precisely while allowing more water to flow. If the clip is lowered, the jet needle is raised and the mixture will be richer. The needle jet and main jet are almost one and the same. The needle jet is the hole the jet needle slides into (the end of the hose is the main and your finger is the needle). Depending on the inside diameter of the needle jet, it will affect the jet needle. The needle jet and jet needle work together to control the fuel flow between the 1/8 thru 3/4 range. Most of the tuning for this range is done to the jet needle, and not the needle jet or main jet. The main jet controls fuel flow from 3/4 thru full throttle. 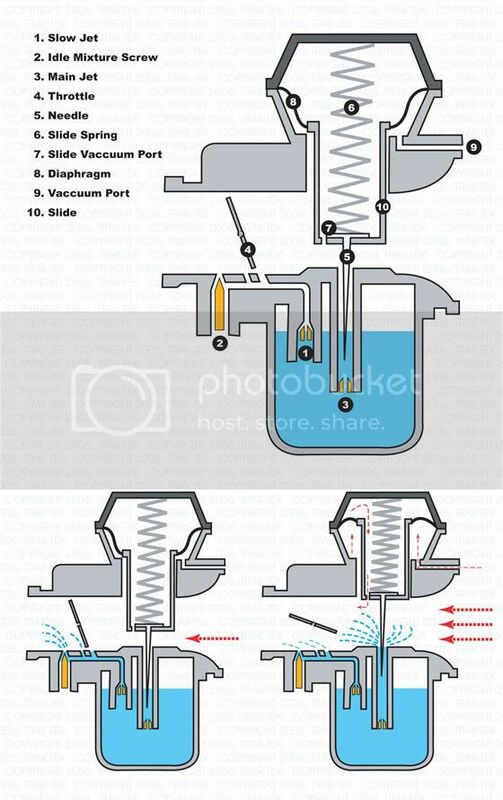 Once the throttle is opened far enough, the jet needle is pulled high enough out of the needle jet and the size of the hole in the main jet begins to regulate fuel flow. Main jets have different size holes in them and the bigger the hole, the more fuel that will flow (and the richer the mixture). The higher the number on the main jet, the more fuel that can flow through it and the richer the mixture. Dynojet 175 main will cover the same range as a 170, 175 and 180 stock main. When you add the more tapered needle, it enriches the mixture over a wider range of throttle openings and provides better throttle response. all the way through. 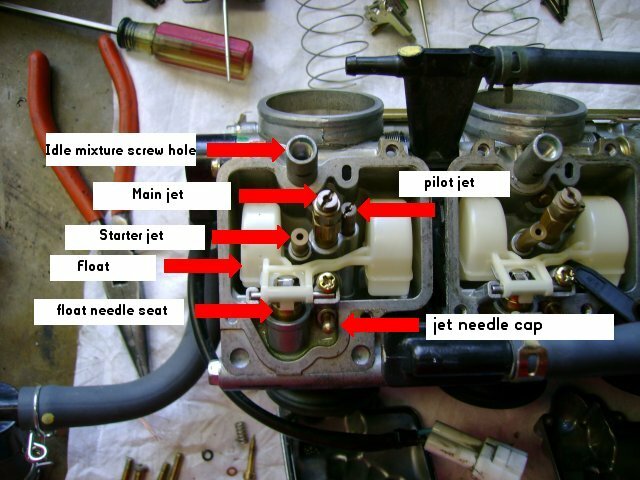 Be very careful not to go to far as you will damage your carburetor and the screw adjustment behind it. Insert the sheet metal screw into the hole you just drilled to get a grip on the cap. Pull the screw and the cap should pop off. Follow the same process on the other carburetor. Now you will have a screw exposed. This is your idle mixture screw. Turning the screw clock wise will lean your idle mixture. Counterclockwise will enrich the idle mixture. The adjustment of this screw will suffice for just about any exhaust modification. If you still have deceleration popping after adjustment of this screw, you may need to move up one size pilot jet. The idle jet should be the last adjustment in your jetting process. More times than not, the manual adjustment of the idle jet will cure any deceleration popping problems and the pilot jet will not need to be changed. Many rejetting kits do not include pilot jets. Jetting and tuning can quickly turn into a nightmare. The Dynojet kit takes some of the difficulty out of rejetting, but not all of it. The directions provide you with a good starting point for whatever system you are running (all stock, stock pipes w/ HP air filter, HP pipes w/HP air filter, etc.). The only full proof way to achieve complete and accurate jetting is to have your bike Dynotuned. This can cost upwards of $250.00 but it is worth it if you want your bike to run to full potential. A dealer that doesn't have a Dyno will generally not spend the hours and hours of adjustments and plugs tests it takes to tune you bike without the help of a Dynomometer. the correct ones for everyone. It is always easier when you have someone to lead the way for you. If you choose to do this yourself, make some phone calls to Dynojet and the manufacturer of your exhaust system for the main jets and needle positions they recommend. It is also a good idea to use the jet kit recommended by the exhaust manufacturer. A. . First of all, NO SMOKING! You are working with gasoline! B. REMOVE THE SADDLE. Remove the saddle from the bike by removing the bolts on each side of the saddle and the single bolt on the rear fender. C. REMOVE THE GAS TANK. Turn the fuel petcock to the "off" position. Disconnect the fuel line from the petcock. On the right side of the bike at the rear underside of the tank there is a small vent tube. Disconnect this vent tube. Remove the tank mounting bolts at the front and rear of the tank. Gently lift on the tank to remove it. It comes of quite easily. The only thing holding the tank on at this point are two rubber pads. Be careful with your tank! Place it on a towel away from where you are working. A new one costs around $600.00 from your friendly local dealership! The above picture is what you will see when your tank is removed. 1. Disconnect the two hoses attached to the crankcase breather storage tank. 2. Remove the single bolt holding the crankcase breather storage tank in place. Remove the tank and set it aside. 3. Loosen (don't remove) the hose claps holding the connecting tube to the carburetor throats. 4. Repeat step three for the other side. 5. Loosen (again, don't remove) the hose clamp holding the connecting tube to the frame tube from the air box. Remove the entire connecting tube and set it aside. 1. Remove the fuel hose from the front (right) carburetor. 2. Remove the carburetor air vent tube. 3. Remove the fuel hose from the rear (left) carburetor. 1. Remove the two screws holding the cable holder to the rear carburetor. Remove the throttle cables from the cable holder (No. 5). You will now be able to move the cable holder out of you way. The cable holder will remain in place. Don't worry about it dropping on the floor. 2. It is a good idea to drain both of your carburetors at this time. Loosen the float bowl drain screws to drain both carburetors. Have some rags handy as quite a lot of gas comes out. 3. This is your idle mixture screw. It may be covered by a soft cap. Please see the instructions above explaining how to access this screw if it is covered. It is the last adjustment made to the carburetors after reassembly. 4. Loosen the hose clamps on each carburetor. Do not loosen the clamps at the manifold. Loosen the clamps above the manifold hose clamps. 5. See step No. 1. 6. Unscrew and remove the choke assembly from each carburetor. Disconnect and store the choke plunger and spring in a zip lock bag so that you don't loose them. 7. Remove the screw and the spark plug wire clamp/guide from the front (right) carburetor. 8. Pull up on the carburetors to release them from the intake manifolds. You will have to pull pretty hard but they do come loose! Then remove the carburetors between the frame tubes. You will have to twist and turn them, but believe it or not, they do come out of that opening! This is a view of the intake manifolds with the carburetors removed. No. 1 shows another good view of the choke plunger. Be sure to remove the spring and the plunger so you don't loose them! You don't want them to fall down your intakes! Plug your intakes with a clean rag to prevent objects and dirt from falling into the motor. 1. The black area pointed to is the slide. 2. If you look closely you can identify the needle in the slide. 2. WORK ON ONE CARBURETOR AT A TIME. DO NOT SEPARATE THE TWO CARBURETORS - LEAVE THEM ASSEMBLED AS ONE UNIT. Remove the vacuum chamber cover screws (4) and remove the cover. There is a spring under the cover so be careful when removing the cover. Also be careful of the diaphragm. Don't poke or damage the diaphragm! The slide and needle will pull out along with the diaphragm. Use the correct size phillips screw driver and turn the plastic holder in the bottom of the slide 90 degrees in either direction to unlock it from the tangs in the slide cavity. Empty the slide into your hand and the plastic holder, the needle and a small spring will fall out. 1. Plastic needle holder and small spring. 2. E-clip on the new needle included in your kit. 3. New more tapered needle. This is a good picture of the new more tapered needle vs. the stock needle (above). Notice the adjustable e-clip on the new needle (this is where specific adjustments and experimentation comes in). Place the e-clip on the desired groove as per the instructions in your jet kit and slide the the proved washer on top of the needle. Reassemble the slide in reverse order (needle in bottom of slide, then washer, then spring and plastic holder). This can be tricky as it is difficult to get the needle, spring and plastic holder to cooperate with each other. Be patient. You'll get it eventually. When the slide is reassembled, place the slide back in the carburetor body being sure the needle slides into needle jet holder. There is a notch on the diaphragm that serves as a guide when installing the cover. Be sure you have the notch lined up and DON'T PINCH THE DIAPHRAGM. Tighten down the screws. Turn the carburetors over and remove the screws holding on the float bowl. There is an o-ring attached to the cover so be careful not to damage it. 1. Remove the main jet and replace it with the recommended size or the size you have chosen (this is where experimentation comes in). Use the correct size screw driver when replacing the main jet as they are soft brass and can be damaged easily. Replace the float bowl cover and the o-ring being sure to get a good seal and not pinch the o-ring. Repeat both slide and float bowl steps for the other carburetor. Another picture to help you identify the jets. 2. Main jet. The needle jet holder is what the main jet screws into. Assemble in reverse order and check for leaks, loose clams and pinched hoses. You may need to put a small amount of oil on the rubber hoses at the intake manifolds in order to slide the carburetors back into place. Congratulations! You have just rejetted your bike!